The Biology Department’s Master of Science program emphasizes research and preparation for further graduate study as well as employment with public agencies and private businesses. A major strength of the program is the option to custom-tailor the overall curriculum to meet the needs and objectives of individual students. Students may pursue a general biology curriculum or may choose to focus their studies in one or more of the following specialization areas: botany, cell and molecular biology, ecology, genetics, microbiology, physiology, or zoology. Students also have the opportunity to study in a state-of-the-art facility with the Fall 2014 opening of the innovative $147 million science building comprising more than 250,000 square feet for teaching, research, and collaborative learning. The Biology master’s requires a minimum of 30 semester hours of graduate credit and six hours of research tools or foreign language. The degree also includes written oral comprehensive exams and a research thesis. Program completion typically requires two to three years. Spring Nolin, a 2013 Biology M.S. graduate, was promoted in January 2014 to quality control supervisor at Vi-Jon, a manufacturer of health and beauty care products, in Smyrna, Tennessee. Nolin oversees four labs (raw materials, product release, stability, and methods development) in two states including in Missouri. While working on her master’s, she had moved up to senior chemist at Vi-Jon. Nolin earned undergraduate degrees in Chemistry from MTSU (2006), where she played rugby, and in Biology from Martin Methodist College (2005), where she competed in soccer and softball. She was finishing her intermediate EMT license and contemplating medical school when she began working at Vi-Jon and decided to work on her master’s. “Dr. Otter’s work in environmental chemistry worked in closely with my instrumental and analytical work I was doing at Vi-Jon,” Nolin said. Nolin works closely with the microbiology lab and the environmental safety department. Her thesis involved three different MTSU departments (Concrete Industry Management, Chemistry, and Biology). “I believe MTSU gave me the tools to reach for loftier goals,” she said. City of Franklin Water Resources Dept. The Department of Biology offers the Master of Science as well as a minor at the graduate level. The department additionally offers courses in three interdisciplinary Ph.D. programs: Molecular Biosciences; Computational Science; and Mathematics and Science Education (concentrations in Biological Education, Chemical Education, Mathematics Education, and Interdisciplinary Science Education) . The Biology Department also participates in the Master of Science in Professional Science interdisciplinary degree that combines business management skills with advance learning in specific science fields. The six concentrations are Actuarial Sciences, Biostatistics, Biotechnology, Engineering Management, Geosciences, and Healthcare Informatics. MTSU is an affiliate of the Gulf Coast Research Laboratory in Mississippi. 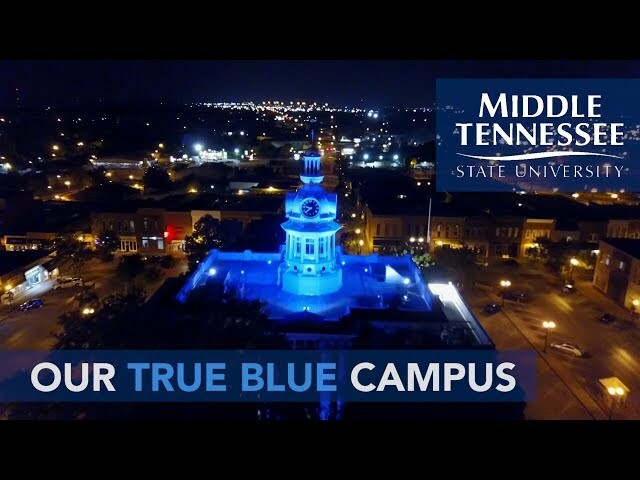 Certain courses in marine biology may be taken for graduate credit and transferred to MTSU. Applicants for the Biology M.S. program must have an undergraduate minor (19 hours) in biology or its equivalent, and 12 hours of chemistry (must include one semester of organic chemistry or biochemistry). For admission the General GRE is required with scores typically above the 50th percentile. Additionally, undergraduate grade point averages in biology and overall near or above a 3.0 are strongly preferred. Applications are accepted year-round, but preference for admission will be given to students adhering to the following deadlines: Summer/Fall enrollment, March 1; Spring enrollment, Oct. 1. Graduate teaching assistantships (GTAs) are available to students who show academic promise and potential as effective students. In general, application for a GTA should be made at the same time as the general graduate admissions application. Master’s candidates must pass written and oral comprehensive examinations; present and successfully defend a research thesis; and complete 6 semester hours of approved research tools or two semesters (6 hours) of a foreign language in addition to the 30 hours. Students in the Department of Biology can pursue a Bachelor of Science (B.S.) degree with one of four concentrations: Genetics and Biotechnology; Organismal Biology and Ecology; Microbiology; or Physiology. The department is one of the participants in Forensic Science, an interdisciplinary major leading to a B.S. A minor in Biology is also offered. The Department of Biology offers the Master of Science in Biology. Required application materials include official transcripts, Graduate Record Examination (GRE) scores, three letters of recommendation, and a personal statement. Students receiving unconditional admission typically will have a 3.40 overall (and in biology coursework) undergraduate grade point average and overall GRE scores above the fiftieth percentile. All students in the graduate program must have an undergraduate minor (19 hours) in biology or its equivalent and 12 hours of chemistry (including one semester of organic chemistry or biochemistry). Applications for admission are accepted year-round; preference for admission will be given to students adhering to the following deadlines: Summer/Fall enrollment, March 1; Spring enrollment, October 1.
submit a personal statement. The personal statement should outline the student's interest in graduate study and indicate a potential area of research interest and thesis advisor. The Master of Science in Biology requires completion of a minimum of 30 semester hours including at least 21 hours at the 6000 level. complete BIOL 6620 Biological Research and submit a Research and Thesis Approval Form and a copy of the research proposal to the graduate program director before the end of the second semester of study. Prerequisite: Permission of department. Selection of a research problem, review of pertinent literature, and execution of the research. Prerequisites or corequisites: BIOL 6620 and permission of department. Completion of the research problem begun in BIOL 6620; preparation of the thesis. Once enrolled, student should register for at least one credit hour of master's research each semester until completion. Minimum of three credits required for M.S. degree. S/U grading. Discussion and critical evaluation of the primary scientific literature. Responsible conduct of research topics including data management, publication practices, peer review, and collaborative science emphasized. One two-hour session. Development of written and oral communication skills relevant to obtaining research funding and presenting research results. Responsible conduct of research topics including mentor/trainee relationships, human subjects, animal research, research misconduct, and conflicts of interest emphasized. Two one-hour sessions. NOTE: Students are expected to complete both seminars during the first year of graduate study. Must be selected from BIOL courses in consultation with graduate advisor. Additional courses to meet the 30-hour requirement may include approved graduate courses in biology, chemistry, mathematics, physics, or other related disciplines. A minor is optional, but if elected, must include a minimum of 12 semester hours (these 12 hours may be included in the 30 total required hours).